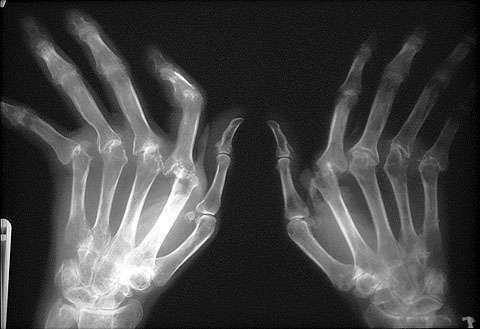 If one metacarpal phalangeal joint (MCP) is involved with rheumatoid arthritis, then typically all of the joints are involved. In this image we see that every MCP joint is affected. The DIP (distal interphalangeal) joints are relatively spared. This patient has also developed ligamentous abnormalities due to RA. A radial deviation of the carpus and ulnar deviation of the digits give the hands a characteristic zig-zag pattern.